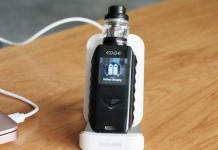 The Joyetech Espion Infinite kit is the latest kit from longtime vape manufacturer Joyetech and the latest in their Espion line of mods that hit the market starting early 2018. First with the Original Espion which was a dual 18650 mod, then the Espion solo which was a single 21700 mod with a touchscreen. Now they have the Espion Infinite which is a dual 21700 mod with infinity tunnel LEDs hence the name. It comes with the new Procore Conqueror Tank in matching colours: Red, Blue, Green, Dazzling (rainbow), Gold, and Black. 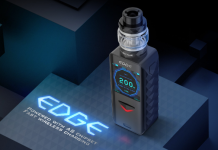 The Joyetech Espion Infinite Kit, features the Joyetech Espion Infinite Dual 21700 mod and the Joyetech Procore Conqueror Tank. A new updated version of the Procore Air Tank, but also uses procore style coils (coil compatibility with baby beast style coils). For the Espion Infinite Mod, it’s a dual 21700 mod in which the kit I received contained 2 avatar controls 21700 batteries. The batteries are loaded via the bottom with a standard hinged door like many mods. They fit good in the mod and the door closes easily but isn’t loose. The front of the mod features a good size colour screen and is surrounded by an infinity tunnel and LEDs with quite a few programmable options. If you like LEDs on mods, you are going to like the way this looks. Others may feel it’s too gaudy. I made this little gif showing it off. Also worth noting on my mod, the screen is a little crooked on the inside. It’s not bad but noticeable and may be really annoying to some people. The mod uses a 5 click to turn on and off and 3 clicks to enter the menu so pretty standard as far as navigating the menu system. The up and down buttons are on top which was an odd choice to me. Seems like an easy point of failure if your atomizer leaks. There is also some button rattle with them. It’s made to handle a 30mm atomizer without overhang but 30mm should go right up to the buttons. I’ll try it myself and see how it goes before doing the full review. The mod itself is mostly built pretty solid and has some weight to (added on by the big batteries) but is a good size and not very large at all. The fire button is large and clicky and the colouring on the rainbow one I have is excellent. It has all the settings and modes you’d expect from a Joyetech mod like power (with preheat option of time and power), temp control for Ni, TI, and SS, TCR mode and a real-time clock which I never understood. There are also individual battery voltage readings as well in the info section of the menu. For the Joyetech Procore Conqueror Tank, it’s not much different than the Procore Air Plus tank. They both have the same capacity (5.5ml), included bubble tank, dragon scale resin 810 tips. Slide back to fill method etc. And they both take the same coils. The only difference is the looks where the Air plus was smooth, the conqueror has much more of a design to it with lots of knurling everywhere. 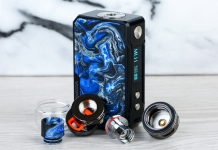 Overall I’ve been using this about a week, not enough time to make an actual review, but with the lack of info out there on this kit, I felt it would be nice to preview since I am liking the mod so far. While I like the tank the coils haven’t been good at all so far. I haven’t used temp control either to judge it or formally tested the power, but it seems to do good in power mode so far. Let me know what you think in the comments below.